Parameter Press is a Winnipeg-based print collective that began with the purchase of a Riso duplicator in 2014. Alongside Quarterly – an annual series of four risograph editions – Parameter Press works with artists and arts organizations to produce risograph material on a project-by-project basis. PP is Suzie Smith, Andrew Lodwick and Abigail Auld. Quarterly is a series of art publications delivered by mail over the course of one year. Each year, four artists or artist collectives are invited to produce a risograph edition, limited only by technical considerations including paper size, ink colour and mailing requirements. The content and format of each edition is determined by the artist. Past editions have ranged from a poster to a book, a collection of printed ephemera to paper dolls. Subscriptions are per four artist set, with mid-year subscribers receiving all previously launched editions immediately. A limited number of single editions are made available after all subscriptions are filled. Parameter Press operates a Riso MZ790U digital duplicator with five colour drums (black, bright red, blue, fluorescent pink and flat gold). The Riso Kagaku Corporation developed Riso/risograph printing in the mid-80s as a cost effective alternative to colour photocopying. Risograph technology shares some similarity to mimeograph printing, screen-printing and offset lithography, and creates images by layering inks that are pushed through stencils onto paper. Bold spot colours, semi-transparency and a limited palette are characteristic of risographs. 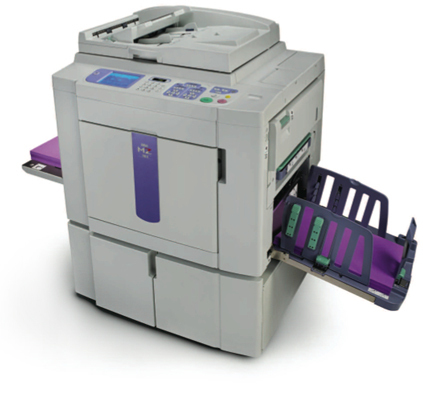 Riso printing is ideally suited to runs of 50-5000.